For lots of thrills and laughter, this fun novelty Shark Toilet Seat sticker is sure to get the attention of your guests. Full color shark decal looks like it is jumping out to take a bite of his unsuspecting prey! 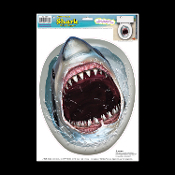 This funny, yet terrifying, realistic sharp toothed monster of the sea restroom commode lid topper is fantastic for scaring your party guests.... the perfect bathroom decoration for a tropical Luau, nautical or pirate theme party celebration. Each Tropical Terror toilet topper sticker is approximately 13.5-inch x 11.25-inch, and features a terrifying illustration of a shark jumping out of the toilet bowl to take a bite. Can be used on most smooth surfaces, such as mirrors, refrigerators and windows. Place this decal on your toilet lid for a creepy surprise for your family and guests! *PLEASE NOTE: this a grabber cling with low-tack for easy repositioning and removal. Easily peel n place on any clean and dry *STANDARD-SIZE toilet lid. Easy to use - Removable - Peel'n'Place - Will adhere to most smooth surfaces. Smooth vinyl-like plastic can be displayed on flat slick non-porous surface. 1) Clean surface to be decorated and dry thoroughly. 3) Remove air bubbles by smoothing surface from the center outward. Reposition as needed. *Always be sure to test before applying to surface, may leave a mark. *Not recommended for use on floors.